There are two main cultured pearl types available on the jewelry market today: saltwater and freshwater cultured pearls. Freshwater pearls are cultivated in the Hyriopsis cumingii freshwater mussel in China. Saltwater pearls include both the Chinese and Japanese akoya pearl known for its perfectly round, small, white shape, exotic black Tahitian pearls from French Polynesia, and Golden and White South Sea pearls from Northern Australia and the Philippines, which are grown in the Pinctada maxima pearl oyster which has both golden and silver-lipped varieties. Shop Adiamor's collection of hand-selected pearl jewelry. Akoya Pearls By far the most popular of all pearl types, the akoya pearl is famous for its small, perfectly round shapes and bright,mirror-like luster. Ranging in size from 2.0-9.5mm, the akoya offers one of the most versatile and wardrobe ready looks of all pearl types. Akoya pearls are measured in half-millimeter increments; popular necklace and earring sizes are 7.0-7.5mm, 7.5-8.0mm and 8.0-8.5mm. The akoya pearl oyster is nucleated only once or twice at a time due to its small size; the akoya oyster, pinctada fucata martensii only reaches about 6 inches in diameter upon maturity and is the smallest of all pearl producing oysters. A pearl surgical technician, called the ‘grafter’, nucleates each oyster with a small, round mother-of-pearl bead and a 1.0mm square piece of donor mantle tissue from another oyster. The bead nucleus and tissue piece are stitched together and inserted into a small slit made in the gonad of the oyster; the nucleus is covered over and the oyster is set aside in a small recovery tank that allows the farmer to monitor the oyster’s progress. Two months later if all goes well, the oyster is transferred to the open ocean waters of the farm. The growing cycle lasts anywhere from 12-18 months depending on the farmer’s preferences and prevailing conditions at the farm. The longer the oyster has had to accumulate nacre around the bead nucleus, the more lustrous and durable the pearl will be, so growth times of at least 12 months are desired. 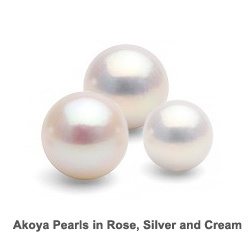 Akoya pearl colors are soft pastels; the body color or main color of the pearls are white to grey, and common overtones or tints of color that show over the body color include rose, silver, cream and even green. Black akoya pearls are also widely available. These pearls are often dyed a solid blue-black or greenish-blue-black color; the result is a pearl with a jet-black body color with midnight blue overtones, and a very bright, ‘hard’ looking luster that is distinctive. There are also blue akoya pearls available today which display bright pink flashes; these are collector’s items and most of these pearls are baroque (not round and slightly asymmetrical) in shape. The softer, pastel shades allow the akoya pearl to be one of the most well-loved and versatile pearl types available to pearl lovers around the world. 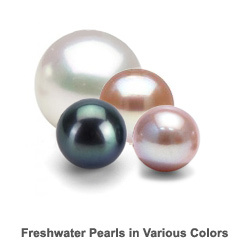 Freshwater Pearls Freshwater pearls are the budget friendly alternative to the more expensive saltwater pearl types. Cultivated in man-made ponds, reservoirs and lakes in China, the freshwater pearl is the most plentiful pearl type on the market today. These pearls range in size from 5.0-12.0mm, and averages between 6.0-9.0mm. Freshwater pearls are measured in whole millimeter increments; the most popular sizes for necklaces and earrings are 6.0-7.0mm, 7.0-8.0mm and 8.0-9.0mm. Cultured almost exclusively in China, small quantities of freshwater pearls can also be found in Japan in the form of Biwa pearls and the noted pearls from Lake Kasumigaura, although due to pollution and over fishing, the famed Kasumigaura pearls are not available in any real quantities today. The United States also produces freshwater pearls; located in the Mississippi River Valley, freshwater pearls from the US are a rare delight. These pearls are sold under the name of American freshwater pearls and are a collector’s item. 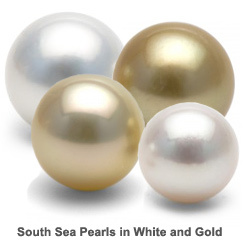 Sea Pearls White and Golden South Sea pearls are the ultimate in luxury cultured pearl jewelry. Cultivated in the tropical lagoons and atolls of the Philippines and Western Australia, South Sea pearls are the largest, rarest and most expensive of all pearl types. The pearls range in size from 8.0mm to an astonishing 20.0mm in size, however the average sizes are between 10.0mm and 14.0mm. South Sea pearls are measured in whole millimeter increments; the most popular sizes are 9.0-10.0mm, 10.0-11.0mm and 11.0-12.0mm for earrings and pendants. South Sea pearl necklaces typically feature a marked graduation rate, usually about 3.0-5.0mm in range. 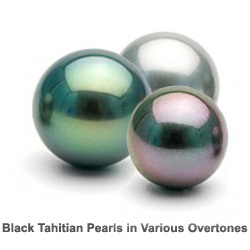 Tahitian Pearls Black Tahitian pearls are the naturally colored black pearls from French Polynesia. Shimmering with colorful overtones of iridescent peacock, Aubergine (eggplant purple), shimmering silver and copper, chocolate, cherry, green and more, these black pearls come in a rainbow of hues to delight even the pickiest of pearl lovers. Cultivated in the warm tropical lagoons and atolls of islands in French Polynesia, black Tahitian pearls are striking and exotic. The pearls range in size from 8.0mm up to 18.0mm, with an average range of 9.0-13.0mm in size. Currently there is no official, industry-wide agreed upon grading scale that farmers, vendors, gem labs and retailers can employ, however the A-AAA grading system is widely used in the US and can provide an easily understood framework with which to grade the various pearl types. Currently Tahitian and South Sea pearl farmers utilize the A-D grading scale with ‘A’ being the highest quality and ‘D’ representing pearls that are the lowest. The A-D grading scale easily converts into the A-AAA scale, with A representing the very lowest grades, and AAA representing the very best pearls. The AAA grade represents the top 3% of all pearls harvested each year; AAA quality pearls feature top-grade luster, a very high degree of reflectivity, smooth, unblemished surfaces and visibly thick nacre. The AAA quality akoya pearl will have a blemish rate of 95% blemish free surfaces with no deep inclusions allowable. The luster will be very sharp and crisp with reflected light sources showing very neat lines on the surface of the pearls; you should be able to see detailed facial features reflected on the surface of the pearls and the nacre will be visibly thick. In the case of akoya pearls, pearl matching will be excellent with little to no variation in tone, luster or size throughout the necklace, and pearls will be perfectly round to the eye. The pearl industry calls these pearls “8-Way Rollers.” For freshwater pearls, the blemish rates will be the same as that of the saltwater akoya, however the luster will be somewhat softer and have a more satin effect; the shape of the AAA quality freshwater pearl will appear round to the eye, but upon up-close inspection may show some variation- the pearls may appear very slightly off-round to slightly ovalish in shape. AA+ quality akoya pearls feature a blemish rate of less than 10% on the total surface area of the pearl; inclusions should be very small and only visible upon up-close inspection (a distance of 2-inches or less). The akoya pearl will be perfectly round and very well matched with little to no variation in tone, color or luster throughout the necklace. Luster is considered Very Good, with only slight satining of reflected light sources on the surface of the pearls; you should still be able to make out your face reflected on the pearl's surface. For freshwater pearls, the blemish and luster rates are the same as that of the akoya, however the freshwater pearls will show more variation in shape and will be visibly off round to the eye. Adiamor does not carry any pearls below the AA+ quality grade, and all pearl earrings and pendants are graded AAA quality by our experienced GIA graduate in pearls.